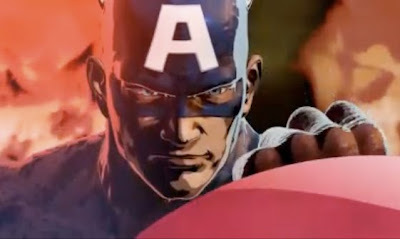 Sure the new Marvel vs. Capcom 3 Fate of Two Worlds trailer has a whole host of allied heroes trying to stop Doctor Doom and Super Skrull from laying waste to the S.H.E.I.L.D. Helicarrier, but who cares about Chun-Li, Iron Man, or the newly announced Tron Bonne, when you have Captain America facing down a big freakin' helicopter (now referred to as the B.F.H)? Coolness in motion is just a click play away. I haven't really read much about MvC3, so it was pretty cool to see unexpected characters from the Viewtiful Joe and Okami games making appearances. This trailer has definitely raised my level of interest in the game! Hey Marc - Welcome to IADW! Yeah they sure seem to be really reaching into all the diverse corners of the Capcom vault for this one and it's great to see... Makes it a bit more interesting than the usual. I wouldn't doubt it, based on the fact that they've done all kinds of strange tie-ins for video games and other products in the last few years (Megamorphs and Rise of the Imperfects, to name a few). Hopefully the difference in this case would be that it would actually be a comic worth reading!